Traffic on the net has picked up of late. That's a good thing. Remember, if you are short on time, just say short timer, any time, give your call sign and you are done. All check-ins are welcome. Liam and Kenny, the dynamic duo! Click here to watch the video and read the full story! I would like to thank Kevin for the dramatic image above, all the aerial images, and many of the people pictures in our album. I would also like to thank Don,Rich and others who also contributed photos. There is a lot of photographic talent out there. This was a year of firsts. For starters we were fortunate to have a reporter from the Ledger interview one of our youngest hams. Liam did an outstanding job. Also a first, we had a real power outage when a limb from a tree fell on the power lines feeding the building. We went dark, but the generator kept us on the air. How realistic is that! Another first was a second power failure, when our main generator went out. Not a problem though. Backups were quickly put into service, and we were off and running again. Yet another first was the food. Instead of the usual dogs and burgers we feasted on Jimbo's pulled pork and chicken, in addition to the dishes brought in to pass. Finally, there was something else very special this year. 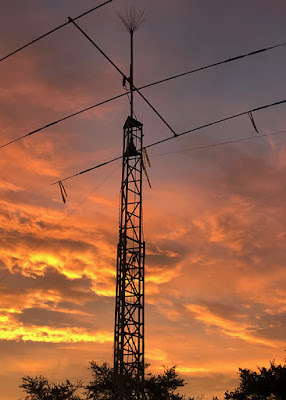 Several hams new to the hobby were exposed to a wealth of information relating to antennas and operations, and most important, given the opportunity to get some on the air, experience. This was a good thing.